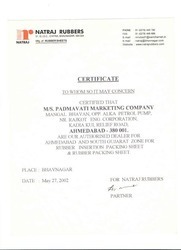 Padmavati Marketing Co.established was commenced in the year 2000. Rubber Sheet, Rubber Mats, PTFE Product, Hose Pipe and more having high a preference in the market, makes up this range. The utilization of the finest raw materials and modern machines, in accordance with the set industry norms and guidelines, helps us standardize the quality of these products. The offered product is known to have a superior sturdiness, durability and resistance to corrosion. In addition, for providing maximum satisfaction to our clients, the offered range is marked at the most reasonable rate possible. Laced with all the required machinery and equipment, our modernized state-of-the-art infrastructure, help us in the attainment of a number of targets and objectives. For maintenance of our market reputation, we keep upgrading the facility on a highly regular basis. For reasons of attaining better management of the firm’s operations, the facility has been parted into a number of highly operational units. These units lead by experienced professionals, work in the most united and dedicated manner, to increase the firms production capacity. 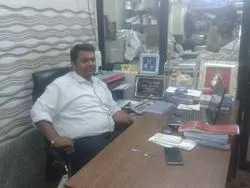 Under the leadership of our trusted and highly experienced proprietor Mr. Haresh Shah, we have managed to conquer greater heights of success. His managerial skills and ability to understand market changes, has been one of our most valuable assets. In addition, he provides several perks to the deserving candidate, for maximum client satisfaction. We have a team of highly skilled and dedicated experts, who are recruited on the basis of their ability and wiliness to work. The team takes us one step closer to our pre-defined goals and objectives. For meeting the industry standards, the team goes through regular training sessions. In order to manage the operations of the team in the best possible manner, we have sorted the team into several highly operational units. The units work in the most efficient and united manner, to innovate new and better techniques to maximize the firm’s production capacity. 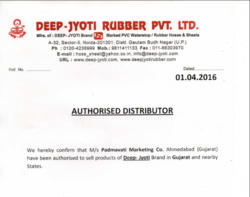 We are an authorised dealer of Deep Jyoti Rubber Pvt Ltd , covering all Gujarat Region. we are committed to quality and on-time delivery to our customers. 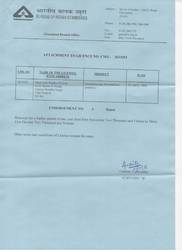 We are authorized distributor of Natraj rubber. We are known in the market to be one of the leading suppliers and traders of this highly commendable and diverse range of Industrial Pumps and Fittings. Manufactured in accordance with the set industry norms and guidelines, quality of this product never deteriorates. Owing to the finest raw materials and modern machines used in its making, the products sturdiness, durability and resistance to corrosion is quite high. In addition, we make these products available at the most reasonable rate possible, packed in a highly commendable manner and delivered on a highly timely manner. 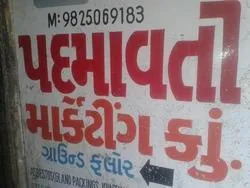 Our company is ISI certified company.